Conservation status: Archaeology monument of state importance No.392, architecture monument of state importance No. 6203 (together with the new palace, ensemble of palace buildings and park). Cesis medieval castle - view from south-west. In the foreground - western tower. 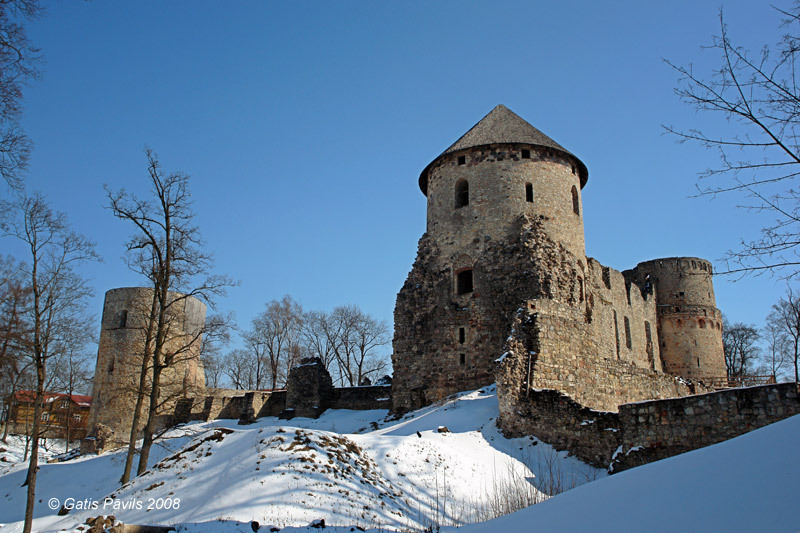 Cesis medieval castle is one of the most significant medieval castles in Latvia - the influential Livonian Order for several centuries had its centre here. The castle is built next to the more ancient hillfort of Vends which also served as a fort of Livonian Brothers of Sword for a while. Until the end of medieval times here was built central part with four blocks and inner yard, there were also three foreparts of the castle. Whole complex had five large towers and several gate towers, intricate system of earthen ramparts, defensive walls and even 42 meters long bridge. Thickness of the walls of towers reached 4,7 metres.